The Rack Warehouse stocks all System One Utility Body and Service Body Truck Racks. The System One I.T.S. Utility Body and Service Body Contractor Rig Truck Racks and the System One I.T.S. 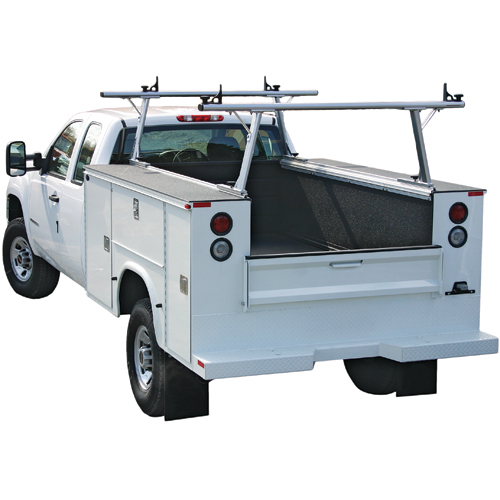 Utility Body and Service Body Utility Rig Truck Racks are leaders among aluminum overhead heavy-duty work racks. The System One I.T.S. Service Body and Utility Body Contractor Rig is commonly used for carrying ladders, lumber, pipe and other long items. Contractor Rigs extend over the roof of your truck and carry up the 1250 lbs. Utility Rigs are positioned over the bed of your Truck and carry 600 lbs. Both racks are built with aluminum components and stainless steel fasteners. The Contractor Rig's rear crossbar may be quickly removed for bed access. 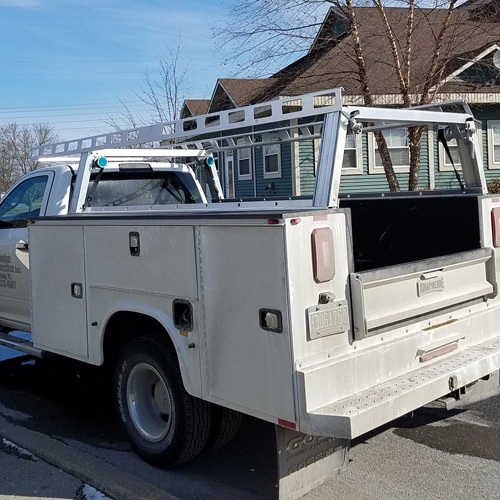 The Utility Rig's rear crossbar and attached leg assembly may be completely removed for access to the rear of your truck bed. Thule TracRac Aluminum Utility and Service Body Truck Racks for Ladders and Work are rugged, durable, equipped with accessories, and manufactured in the USA. The Thule TracRac Aluminum Utility and Service Body Truck Racks for Ladders and Work are available to carry ladders, lumber, pipe, building materials and other gear. Thule TracRac CabRac Window Guard is in stock to protect the cab and rear window of your truck from shifting cargo. Thule TracRac Accessories include window screens, base rail tie downs, crossbar tie downs, tool box mount kits, kayak saddles and more.